In Bowmore, the island?s main centre, the Mactaggart Leisure Centre comprises a superb swimming pool, sauna and fitness gym open each week from Tuesday to Sunday. Adjacent is Morrisons Bowmore Distillery, one of the eight working distilleries on Islay and welcoming visitors for a tour and dram. 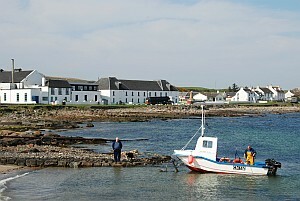 Close to The Oystercatcher B&B are Ardbeg, Lagavulin and Laphroaig Distillery. Bowmore famous Round Church stands at the top of Main Street, overlooking the village. The historical significance of Islay cannot be over emphasised. It is from Finlaggan, the cradle of the Clan Donald, that much of Argyll was ruled by the Lords of the Isles. Here, in the ancient burial ground is the grave of Robert the Bruce?s grand-daughter, and there is a seasonal visitors? cottage on-site. Religion played a major part in Islay?s history, with many carved stones, including the Kildalton Cross. The neighbouring Isle of Jura is one of the last wilderness areas of Europe. There is a regular ten minute ferry service from Port Askaig on Islay to Feolin. Jura has a population of around 150 people who live mainly along its east coast, and principally in the village of Craighouse. Here is situated Jura?s only hotel.